Pillow Box Die | Stamp Right Up! Lawn Fawn’s pillow box die has now become my go to die for anything party favor, candy box, or even a gift card or a coffee card – it’s the perfect size to fit any standard sized gift card as a matter of fact. I just LOVE this pillow box. Lawn Fawn never disappoints, and this one really hit it out of the park for me! The die takes less than one half of a 12×12 sheet of cardstock, and create score lines that make the box ridiculously easy to assemble. One strip of tape or Tombow and that`s seriously it. I love how the top of the pillow box opening has a little notch in the underside flap to make it easy to open. And the semi-circle scored perforations make it super easy to fold the tabs down when you’re ready to close it too. With fall / autumn quickly approaching – and people are now thinking about pumpkin spice lattes ( 😛 ) I had so many ideas on hwo to use this pillow box die! I made two Halloween party favors, or candy boxes; and one fall themed pillow box that could be equally as good for either a thanksgiving hostess gift, or just a thank you gift with a Starbucks coffee card inside! Here are my projects: two Halloween party favors or candy boxes, and one that could double for either a Thanksgiving hostess gift, or just a Thank You gift with either candy, a gift card, jewelry, you name it! The sky`s the limit with this adorably perfect pillow box. 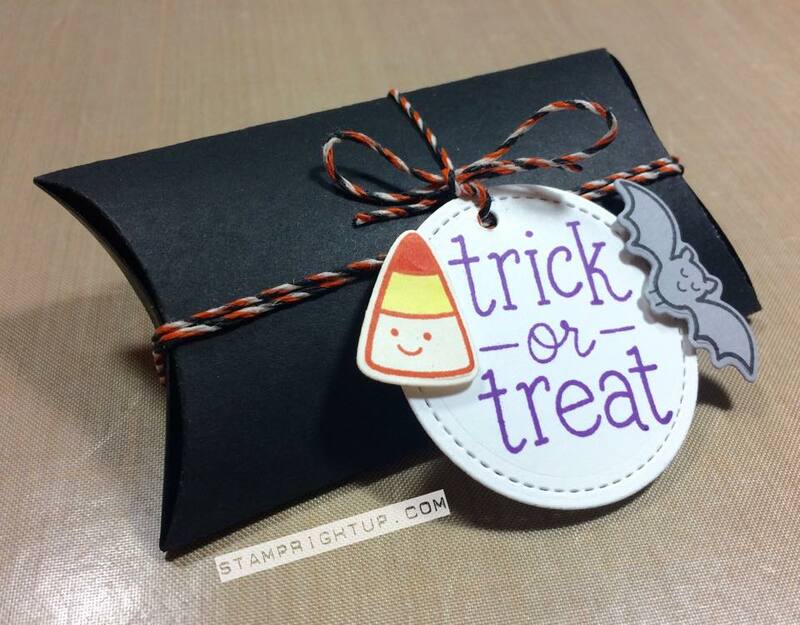 For my second Halloween box, I stamped out my own backround paper using the Trick or Treat stamp set in Lawn Fawn’s new Doe ink. The belly band for the pillow box I cut a 2″ wide strip from the new Let’s Polka In The Dark mini 6×6 pad. 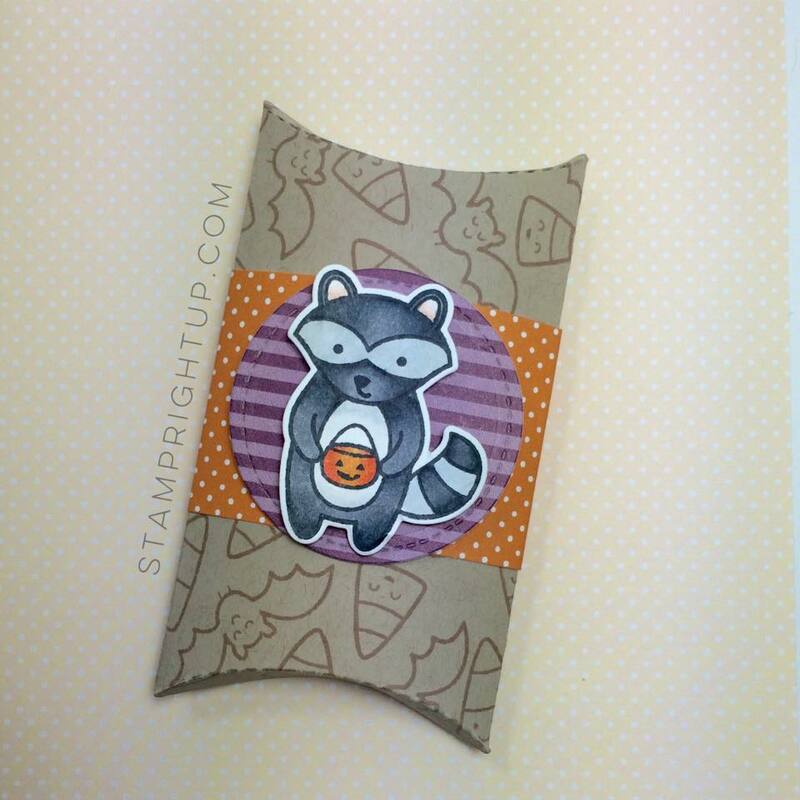 From the same pad, I pulled out a witches brew sheet and die cut circle for my racoon that was stamped from the Holiday Party Animal set. 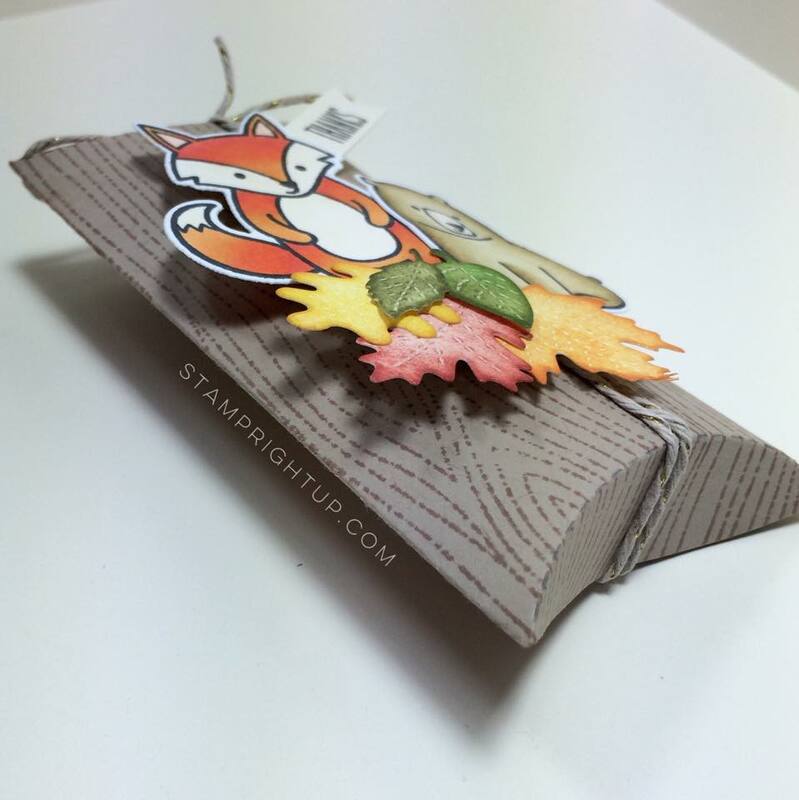 This box was created with fall / autumn in mind – but I wanted to make it versatile so that it could be either Thanksgiving OR just a regular Thank You gift box. Using the wood grain’s backdrops set I stamped the entire pillow box after I die cut it in Doe ink. 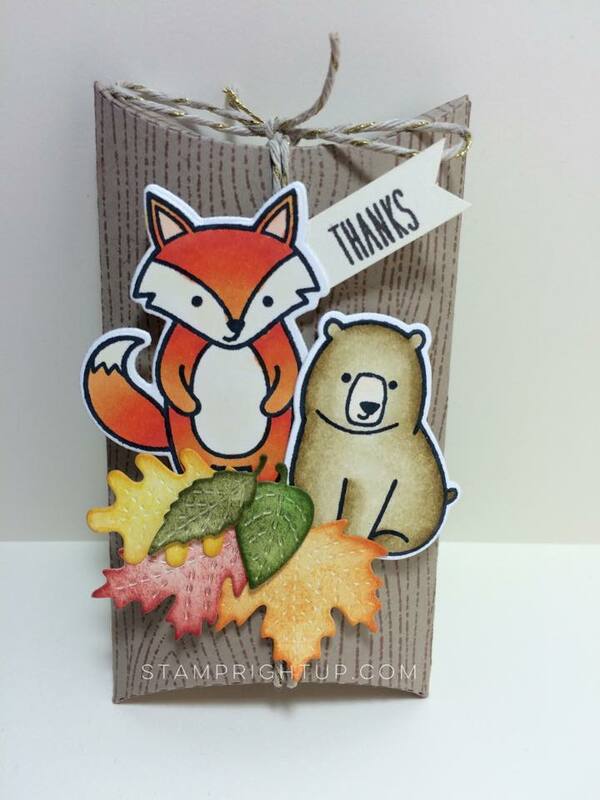 The new Mini Stitched Leaves came in handy as accents for my Fox (from Party Animals) and my Bear (from Love You S’more). Die cutting each leaf in a vanilla card stock, I blended distress inks onto each leave to create color and really bring out the stitching. The Thanks sentiment was also from the wood grain backdrops set as well. Finished off with Lawn Fawn’s Gold Sparkle twine I was super happy with the finished project! As always, your comments & feedback are welcome and appreciated! Thank you for reading this far & I hope see you again for my next project!